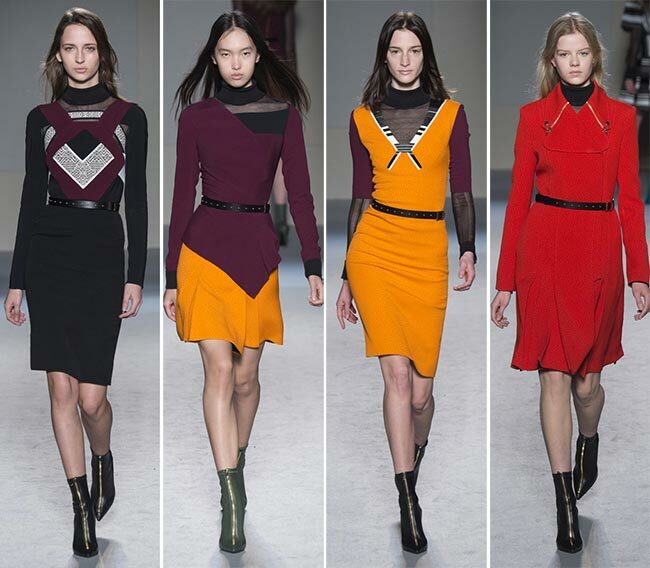 Such lovely pieces Roland Mouret doth bring to the Paris Fashion Week today. 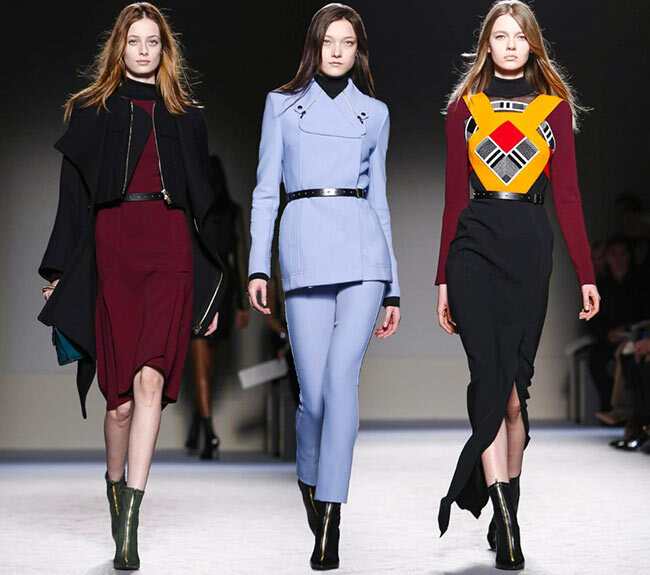 While not every outfit will be to our tastes, the color palettes and the tailoring, the use of striped and contrasting bits, as well as the body hugging designs all work in the Roland Mouret fall/winter 2015-2016 collection. The 53-year-old French fashion designer became quite famous with his introduction of the 2006 Galaxy dress that was known as the dress of the spring season and you couldn’t look at a celebrity newspaper without finding it gracing the bodies of the A stars and the pages of the magazines. And then came his moon dress for Victoria Beckham that stirred up quite the storm. In 2007, Mouret debuted his RM label with some rather chic and pretty intriguingly geometric dresses, the use of which is apparent in the collection seen today as well. The Roland Mouret fall/winter 2015-2016 collection includes some rather lovely pieces, beginning with brick patterned black and grey and white outfits, the dress being a crop top and short midi skirt twin set stitched together with a black mesh abdomen region, the white skirt giving way to a black insert underneath, seen through the center slit, and the coat thrown on top being the perfect match with its white brick pattern seams and black with brick pattern outer fabric. This was finished off with a pair of black booties with a pointed toe for added streamlined effect. The models all wear their hair straight, blow dried to perfection, combed out form a center or slightly off-center part. The faces are mostly bare and left quite natural, as has been the trend since 2014, while the idea of bare legs also is developed throughout, peeking out from under shorter midi skirts. 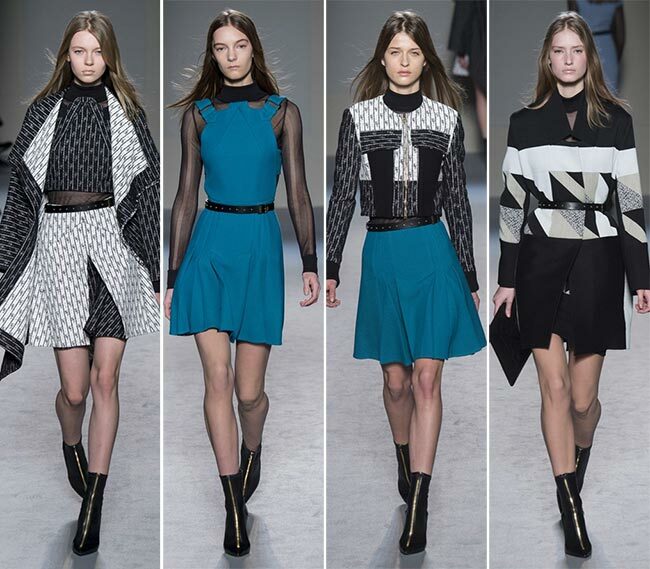 The shoes are all the pointed toe booties, mostly coming in black but also seen in electric blue and grey. The hemlines generally fall to just above the knees though we do have a mini cut dress or two or three. Generally the pieces are a lot more demure and very much oriented towards a woman, who loves to be stylish while setting her own standards for everything in life. The collection includes everything from professional attire to casual wear, date-night pieces and ones that really get the party started, such as the mustard yellow body-con with the mesh chest, the turtleneck and the long sleeves in mesh and Marsala. This dress can technically be worn without the black mesh top underneath, essentially becoming a deep V-neck dress with half sleeves, the neckline finished off with black and white stripes and a black belt around the waist. The use of Marsala throughout the collection is perfect and something we haven’t seen in most of the other collections, despite it being the color of the year according to Pantone. The use of black and white, mustard yellow and Marsala, red and multiple shades of blue definitely make for an interesting collection full of contrasts and such lovely pieces that we can certainly see hanging in our closets. 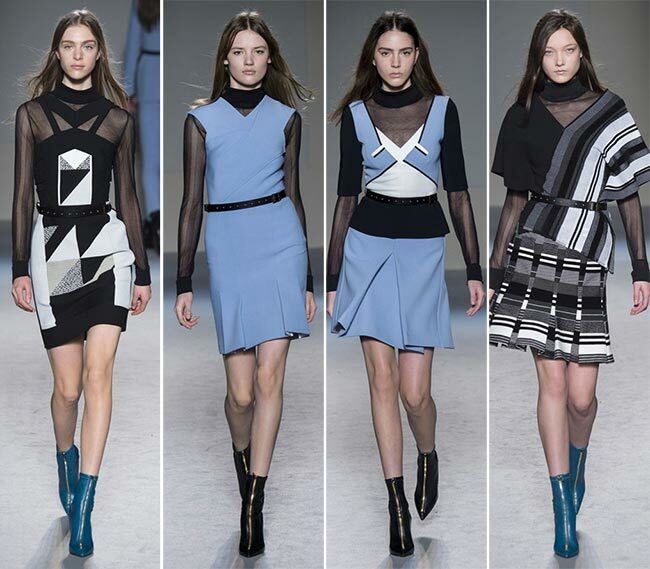 That may not be said for all the collections presented today on the Paris Fashion Week runway, but Roland Mouret has certainly won our hearts here.